Adults: $130 USD per person. Children: 3-8 yrs old. $100 USD. Infants: 0-2 yrs old. $45. Includes baby chair. The Arenal Volcano with Baldi Hot Springs tour is by far a favorite among travelers. 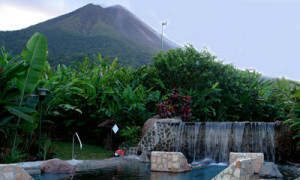 This tour offers the auspicious site of the imposing Arenal Volcano and the soothing thermal waters of Baldi Hot Springs. Not to mention the lush vegetation and unforgettable views that make this place one to remember. 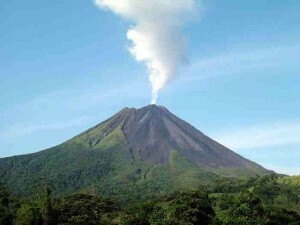 The impressive Arenal Volcano is a magnificent natural wonder that is situated in La Fortuna (The Fortune) of San Carlos, Costa Rica, providing thousands and thousands of tourists with the opportunity to witness volcanic activity, such as the white plumes of smoke that emanate from the conical shaped behemoth. It is important to note that the volcano had previously been assumed to be dormant, until in 1968, when it experienced a major eruption. Enroute to the Arenal Volcano there will be a stop in the famous town of Sarchi, known as the birthplace of Costa Rica’s Artisans. In Sarchi, you may very well see an ox cart that holds the title as being the largest ox cart in the world. The cart is made of wood (cedar) and is decorated with stunning colors, such as a bright orange. The design is typical and intricate, indicative of traditional oxcarts. The ox cart is two stories high and took 70 days to complete. The oxcart is also deserves an honorable mention in the Guinness book of world records. The journey will then continue, traversing diverse plantations with agricultural products, including pineapple farms, and mango groves, ornamental plants and cattle ranches until arriving to the small town of La Fortuna, and stopping to enjoy lunch at a cozy restaurant with a spectacular view of the Arenal volcano. Then you will go on to relax at one of the best hot springs in the area where you will enjoy the rejuvenating effects of the thermal waters, as well as an optional massage or other special treatment that must be reserved ahead of time. The facilities at Baldi provided 25 separate mineral water reservoirs that flow naturally from the volcano. The medicinal waters are certified by L.N.A. (Laboratorio Nacional de Aguas), and the temperatures range from 93, 100, 102, 104, 109, 110, 113, 116, 152, providing clients with a wide range of options that fit their needs. And for a perfect ending, before going back to San José, a wonderful dinner will be served with a great view of the volcano so that you do not miss any opportunity to look at the stunning and classically shaped volcano one more time. What to Bring: Swimsuit, light clothing, sunscreen, hat, towel, Sweater; (for a deposit of $ 10, you can have a locker and towel, which will be returned at the end). Departure point: Tour departs from all major hotels in San Jose. Departure Time: Hotel pick up at approximately 8:00am. Return details: Returns to original departure point at approximately 10:30pm.